I first dug into the December Blizzard of the Month in 2011. 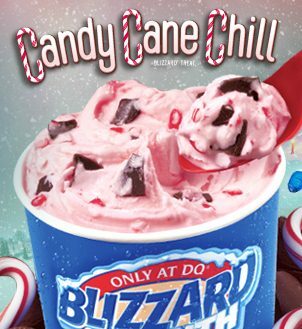 It was the fun sounding candy cane chill blizzard? well let's emphasize CHILL because you need to chill out and not worry if you miss this one. 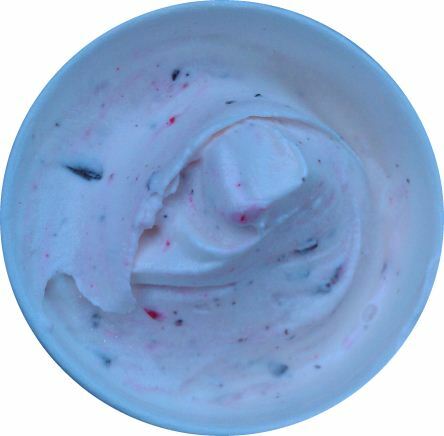 No need to rush out for it, instead, if you need a chilled candy cane fix, go rush out and get some of that Haagen-Dazs peppermint bark ice cream that I reviewed, it's much better. And here is what it really looked like. This is my blizzard that should be "loaded with peppermint candy cane pieces and choco chunks blended with creamy vanilla softserve". As can be the case with DQ, there are two problems with that statement. ONE, there are very few peppermint pieces. TWO, those aren't chunks, they are line shards. THREE (yes three, just thought of another problem), I find it hard to believe there isn't some kind of mint injection on this one, as in the candy cane bits are really some kind of pink candy cane sauce with candy cane bits inside. I take my first bites and while it's not bad, it's not H-D peppermint bark. The bar has been raised very high, and a treat with minimal peppermint pieces just isn't going to cut it right now. It was the day after Christmas and I was ready for my taste buds to be wrapped in a warm, minty mess, but the mint is just so so. It's a classic case of DQ not being consistent with their treats. A little further down and things are looking a little more promising. Take a minute to check out the choco "chunks". Look how thin they are. The unique thing here is that the thin frozen slices have a similar crunch to thin slices of candy cane. Unfortunately they aren't candy cane, and they are so thin that they aren't exactly adding chocolate flavor here. This fact is made more striking because there are tons of these shards but still minimal chocolate flavor. I got bored about 1/3 of the way through and decided to really stir things up (you know, like the server should have done). 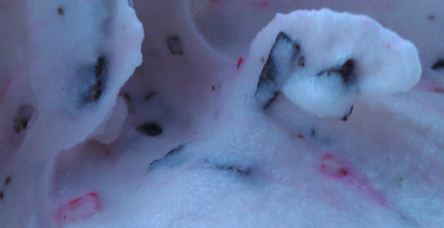 I now have a thoroughly pink treat and you can see just how numerous the choco bits are. They are literally everywhere...wish the candy cane pieces were everywhere.... you know, I don't think I saw a single big bit of candy cane (and even if I crunched one, I just would have assumed it was a choco shard). I finished my somewhat minty blizzard and headed off to the grocery store with daughter (she had wisely gone with an Oreo blizzard). Strangely enough, what do we see at Market Basket? 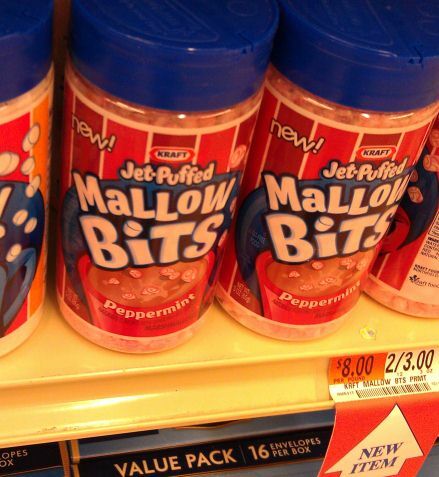 New KRAFT Jet-puffed peppermint mallow bits! That's mini marshmallows to you common folk, hehehe. These would probably be fun on the right ice cream or thrown into some hot cocoa, but I can't imagine finishing off the container, so we left them be. As we headed home with our pizza and groceries, I had a little more time to reflect on my blizzard.... nope, still not impressed. Had it been well made, and had I not had the H-D peppermint bark, then I would probably give this blizzard a passing grade. 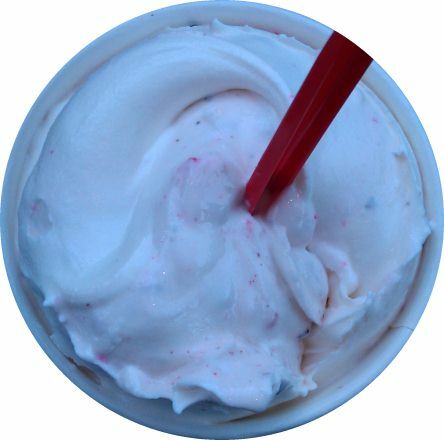 However, in yesterday's scenario, the candy cane chill blizzard is a bust for me. Maybe I will try it again next year, but for now, I'm good. History: Blizzard of the Month for December 2011 (first review), December 2012, December 2013. 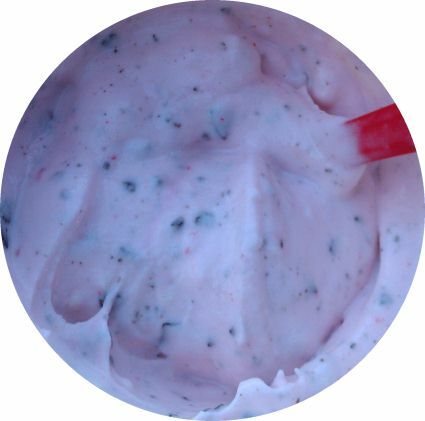 2012 Update: The Candy Cane Chill flavor had become an entire family of products. 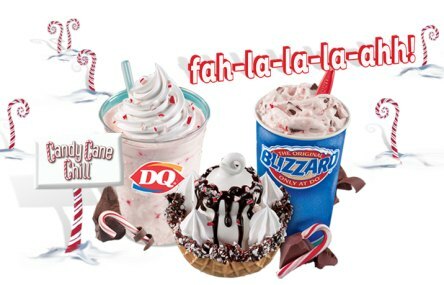 You could also get the Candy Cane Chill Royal Shake and the Candy Cane Chill Waffle Bowl Sundae. 'Tis the season to be minty! --- Update to the Update: Royal Shakes have been retired and I'm not sure waffle bowls are still a common menu option. looking at how thick your blizzard is compared to the first time I tried one earlier this month I do believe that I must've gotten the most liquidy blizzard ever. Next time I'm visiting family I'll have to go to a different dq since I see your point on the quality control and I really wasn't impressed the first time around. I would say mine wasn't even the consistency of a frosty. It was kinda early so maybe the mix didn't set up in the machine or something yet. Dubba I got these marshmallows in my stocking and are AWESOME in cocoa.....When stirred into the water, they melt and make the cocoa taste like peppermint. I also tried the spiced pumpkin ones and they rock! So glad I passed on this one. I really, really thought about it, but the something about the pink warned me to stay away.